OT 1 – Hoover holds the basketball near half-court for the entire 4 minutes and missed the only shot (a fade-away) of the first OT on the siren. OT 2 – Hoover and Ames combine for a total of 3 field goal attempts in 4 minutes. OT 3 and 4 – During the third and fourth overtimes there were more shots, but there was still a clear focus on slowing the basketball down. This is not a one-off scenario. The ‘stalling’ strategy is a commonly used tactic by coaches in high school basketball across the country. I think we can all agree that this is not the kind of basketball we want to see in the dying minutes of any game. A shot clock is the inevitable solution to this problem. Although my preference is clear, my goal with this article isn’t to pretend I know the solution to every question or to imply that there are no negatives to adding a shot clock. And just like the positives, I’ve done my best to cover them in great detail. I do not blame any high school basketball coach for utilizing the stalling strategy to increase their team’s chances of victory. In fact, I applaud the smart coaches who do this! The coaches of Hoover and Ames did exactly what I would have done in the same scenario. You see, the job security of a high school coach relies on the numbers in the win and loss columns. As long as they’re playing within the rules of the league, a coach must do everything they can to put their team in the best position for success. Unfortunately, since high school basketball rules allow it, that often means stalling the basketball. Because the NFHS allows it to happen. 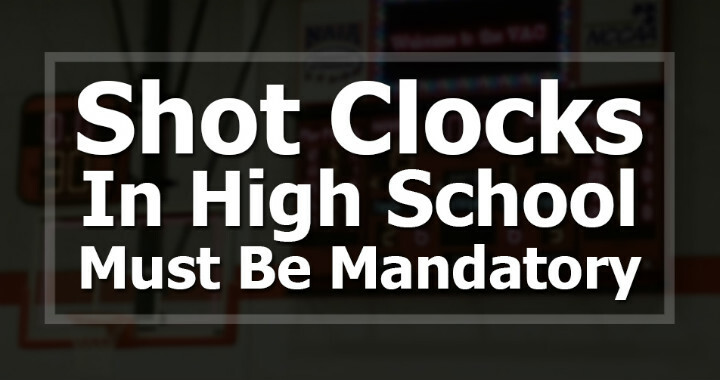 It’s up to the National Federation of State High School Associations Basketball Rules Committee to put rules in place (a shot clock, preferably) that stops this strategy hurting high school basketball. What is a shot clock? To put it simply, the shot clock is a timer used to increase the pace of a basketball game. Once a possession starts, the offensive team must attempt a shot within the set time limit displayed on the shot clock. The ball must be released from the player’s hand within this time and either touches the rim or enters the basket. Failure to get a shot off within that time or hit the rim on a shot attempt on the shot-clock buzzer will result in a turnover. Why was the shot clock first invented? The shot clock was first introduced to the NBA in the 1954-1955 season because too many teams were getting a small lead and then stalling the basketball for the rest of the game. The only way the trailing team could get the basketball back was to foul over and over again until the offensive team went to the free-throw line. Naturally, this led to low game attendance, next to zero press coverage, and many incredibly boring games of basketball. The NBA needed to do something to fix this — and fast. Enter the basketball savior: Danny Biasone. 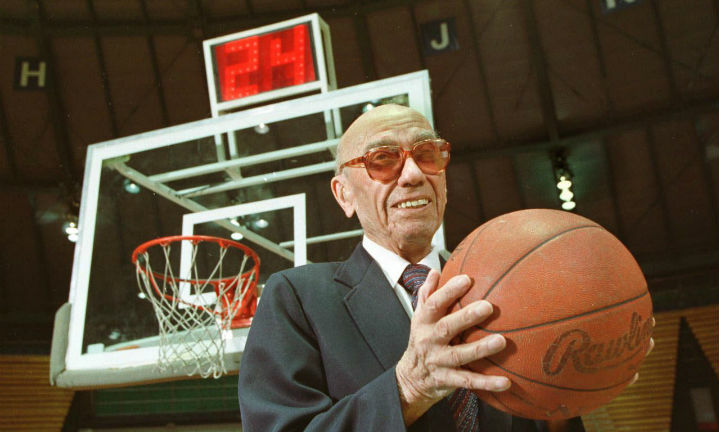 Danny Biasone, the owner of the Syracuse Nationals at the time, was the first person to truly push for a shot clock to be introduced to basketball. He decided on the specific time of 24-seconds after analyzing the fast-paced NBA games he had enjoyed and noticing in these games that each team took approximately 60 shots each. 2,880 seconds (48 minutes) divided by 120 (total shots) = 24. And with that, the 24-second shot clock was invented and introduced to the NBA. The women’s college game was the next to bring the shot clock into their game in 1970 by implementing a 30-second shot clock which still remains today. Next was men’s college basketball in 1985 with a 45-second shot clock that was later shortened to 35-seconds in 1993 and then shortened again in 2015 to 30-seconds. The WNBA launched their league in 1996 with a 30-second shot clock and the decreased it to 24-seconds in 2006. Instead of waiting until the end of the article to give my recommendation, I’m going to give it to you at the start because I’ll refer to it numerous times throughout the article. High school basketball should implement a 35-second shot clock. It’s long enough to complete any basketball offense as long as your team is playing smart, fundamental basketball; while it also removes the opportunity for teams to stall the basketball for several minutes at a time. Am I opposed to the current 30-second shot clock that girls high school basketball have in place? Nope. Would I be opposed to a 30-second shot clock or even a 45-second shot clock? Nope. Let’s just introduce a consistent shot clock and then people can talk about adjustments that they want to make in the future. 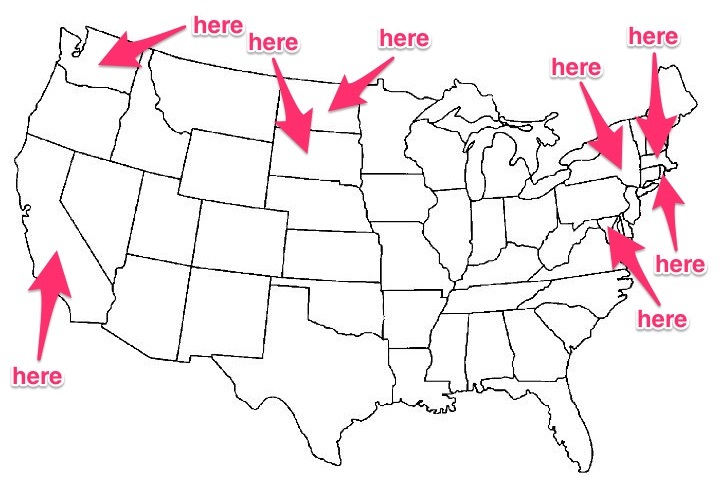 There are currently only 8 states using a shot clock in high school basketball. California: Boys – 35 seconds. Girls – 30 seconds. New York: Boys – 35 seconds. Girls – 30 seconds. Washington: Boys – 35 seconds. Girls – 30 seconds. Massachusetts: Boys – 30 seconds. Girls – 30 seconds. Maryland: Boys – No shot clock. Girls – 30 seconds. Rhode Island: Boys 35 seconds. Girls – 30 seconds. North Dakota: Boys 35 seconds. Girls – 30 seconds. South Dakota: Boys 35 seconds. Girls – 35 seconds. Unfortunately, by going against the NFHS’s ‘no shot clock’ rule, all of these states are ineligible to vote on the rules committee in the future. Now, let’s discuss the 4 most important pros and cons of implemeting the shot clock. Two high school teams have been competing hard against each other for 3 and a half quarters. It’s an enthralling game with only 4 points the difference with 5-minutes remaining. You then proceed to watch the final 5 minutes turn into 20 minutes of fouling and free throws. This is a common finish to a current high school basketball game. If you have a team that can slow the basketball down without turning it over and also make their free-throws, without a shot clock there is currently no benefit whatsoever for them to risk shooting the basketball and missing unless they get an open layup. But wouldn’t you have loved to watch these two teams continue the exciting game and battle it out until the very end? No one wants to go and watch a basketball game where one team stalls the basketball for half of the game. In fact, when it happens, it’s not uncommon to hear the spectators and parents of the team stalling the basketball yelling out to their team to ‘shoot it!’ or ‘play the game!’. A fast-paced game will definitely increase the number of people that attend high school basketball games. 1. Players enjoy playing in front of bigger crowds. 2. It’s great for the community. 3. More money through entrance fees. 5. More young kids watching the game. This one seems obvious to me. More playing basketball = better players. No player on the court is going to improve if one team is holding the basketball up for several minutes at a time while every player on the court is standing in the same spot watching them. By increasing the pace of the game with a shot clock, players will have more opportunities on offense and defense. One of the most important roles of a high school coach is preparing their kids for the next level of basketball if they choose to pursue it. There is a large benefit to allowing players to get accustomed to playing with a shot clock in high school. a. Experience the pressure of the shot clock winding down. b. Get in the habit of keeping an eye on the shot clock. c. Learn what to do in an end-of-clock scenario. A high-school shot clock will prepare players for a college shot clock just as the college shot clock prepares players for basketball at the professional level. Disclaimer: The prices are approximations based on my own research and talking to different coaches. Prices for each high school will be different depending on many factors. The price of purchasing, installing, and operating a shot clock are not cheap. Research suggests that it will cost approximately $2,000 – $4,000 for most schools to purchase the shot clocks and have them installed. There are installation costs that will vary greatly depending on the current setup. Some may need to purchase entire new scoreboards to make it happen which will be a remarkably more significant cost. And to be honest, I don’t know. I don’t know the budgets of each individual school and I’m not going to pretend like I have a simple solution for each individual school that has this problem. What I do know is that the high schools in 8 states were able to make it happen. I’m 100% sure many of their schools had similar financial concerns when the idea of the shot clock was first being talked about seriously. But when it was made mandatory, they all found a way to pay for it. This is a one-time cost for each school that will have a significantly positive impact on their school’s basketball program for years to come. Many coaches in favor of a shot clock claim that it will without-a-doubt lead to improved defense. In fact, I think there’s a chance that it might hurt overall defense with more teams falling back into a zone. I’m not completely against zone defenses at the high school level like I am at the youth level, but I do believe it’s beneficial for teams to be playing a man defense most of the time. One of the main reasons coaches sometimes stall the basketball is to drag the defense out of a zone and force them to compete man-to-man. Once the shot clock is part of the game, the offense doesn’t have that option anymore. 3. Who’s Going to Run the Shot Clock? While some schools have a seemingly endless supply of volunteers willing to jump in and help whenever needed, not all schools have this luxury. Many schools have a hard enough time getting people to fill positions on the scoreboard and helping out with setting up. The thought of another position to fill would make them cringe. Deciding who’s going to run the clock is one of the most important questions each high school must ask. • Will it be a paid position? • Will it be a volunteer position? • Will they need to pay another referee to run it? As for the knowledge part of running a shot clock, I don’t think it would be too much of an issue. I’ve seen plenty of people get taught the basics on how to run a shot clock in 5 minutes and then immediately done a perfect job during a game. Even a simple YouTube video like this one is perfectly capable of teaching beginners the shot clock basics. Stalling the basketball is a strategy that many high school coaches employ to compete against more skilled teams. The theory is, the fewer the possessions in a game, the more chance the underdog team has of coming away with an upset victory. When preparing for a next game, one of the most important things a coach must do is decide if they want it to be a high-possession game or a low-possession game. If the coach thinks their team would have more of a chance in a low-possession game (usually meaning they’re playing a team more skilled than they are), then they’ll often slow the ball down and employ the spread offense at some stage during the game. This often allows underdog teams to keep game competitive or at least prevent a large point differential. By implementing a shot clock, these teams won’t have the option to slow the game down anymore. 1. The “We don’t need one. Our games are always high scoring. It wouldn’t be a factor in our league anyway” argument. This is literally the worst argument against shot clocks of all time. But do you know when it will? During the most important games of the season! When the season is on the line. Knockout tournaments. Playoff games. Championship games. That’s when smart coaches start applying the stalling tactic to give their team the best possible chance to win. Don’t allow the lack of a shot clock to ruin the most important game of the entire season. 2. The “We surveyed the coaches of our league and they were split 50/50 on wanting to implement a shot clock” argument. Asking the current coaches in each league often isn’t a great strategy for figuring out what’s best for the competition. Want to know the obvious reason why? Every coach is going to answer by analyzing their current team and asking themselves whether a shot clock is going to help their team or not. If it wouldn’t benefit their team, they’ll vote against it. If it would benefit their team, they’ll vote for it. Naturally, most surveys completed by the coaches in a certain league return close to 50/50 on each side. 3. The “The fundamentals of basketball at the high school level are already bad enough. Implementing a shot clock and forcing players to rush their shots will just make it worse” argument. If your team can’t get off a quality shot within 35-seconds, there are far bigger problems on your team to worry about than the shot clock. Sure, there are going to be times when your team gets close to the shot clock and need to force up a shot attempt; but that should not be often. If your team is setting strong screens, cutting with purpose, staying aggressive, and moving the ball well, there’s no reason it should regularly take a high school team more than 35-seconds to get off a good shot. 4. The “‘Why should we change our sport just to entertain the spectators? That’s not why we play. If they don’t like it they can leave” argument. The kids don’t want to play in them either. They’re bored, humiliated, and they’re not developing into better players while they’re standing around watching the point guard dribble at half-court. 5. The “Barely anyone else has changed so why should we?” argument. There have already been 8 states that have committed to improving high school basketball and there needs to be even more! Who’s going to be next to step up? 6. The ‘High school players don’t have the skills to get off a good shot with only 5 seconds left on the shot clock’ argument. There are going to be some wild shots attempted at the end of the buzzer. That’s something we have to accept. It’s the end result of an offense not having created a better shot opportunity in 35-seconds. Players aren’t going to miraculously find the skills to perfectly navigate an end-of-shot-clock situation when they enter the college system. Knowing what to do with the shot clock winding down is something that all high school players should practice and learn before they make the jump to college. No matter how in favor I am of introducing shot clocks to the high school game, I can appreciate the difficulties that a lot of schools face with funding and personnel. With that said, the positives of a shot clock far outweigh the negatives. This is something that we all should be pushing to happen as soon as possible. There is no doubt in my mind that there will be a point in time when shot clocks are made compulsory in every state; it will be one of the most important and positive changes in high school basketball history. Do you think high school basketball should add a shot clock to the game? Leave a comment below. I’m excited to hear your opinion.